It’s the time of year we all start to think about the outdoors and preparing for the summer days spent lazing around in the garden or hosting a garden party. When it comes to spring cleaning the garden there is no need to spend hours and hours scrubbing away with some soapy water and a sponge, the Stihl pressure washer promotion is now on! 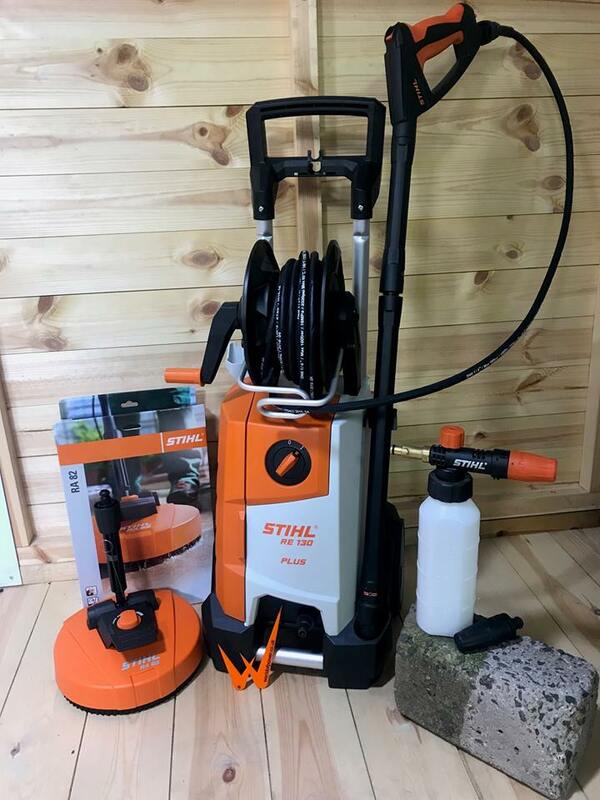 Rain, grit and mud at this time of year can make it difficult to keep everything clean but the Stihl electric pressure washer range is an all in one machine which will clean everything from the patio/decking and garden furniture to cars and windows. It’s time to up the pressure! Stihl pressure washers are designed to cut through dirt without causing damage to the item being cleaned, thanks to the adjustable bar pressure on all models. With a range of accessories available such as long extension lances for cleaning hard to reach or difficult to access areas and pressure brushes for a range of applications, the spring clean has never been so easy! From the smaller RE 88 all the way up to the impressive RE 143 PLUS model, the Stihl range is supported by a range of cleaning agents including car shampoo, universal cleaner and special cleaner for stone, wood, and concrete to complement their accessory range making it a one stop shop for improving the appearance around the home, garden and driveway! Until the end of April we are offering freebies on certain models of pressure washer worth up to £70*! Order the RE98 / RE 109 and receive a free RA 82 surface cleaner OR order the RE 119 / RE 130 PLUS and receive a free RA 82 surface cleaner and foam nozzle free! Stihl offer a 3 year domestic guarantee across their range of power washers, so rest assured you are purchasing the Stihl quality known and loved by many domestic users and professionals all around the World! Stihl RE 130 PLUS pressure washer with freebies – whilst stocks last! Features adjustable pressure / flow control, these Stihl pressure washers have a system which delivers direct regulation of the water flow and working pressure on the pump allowing the machine to be set up for specific applications. Boasting the life and performance of both the engine and the pump, the low speed engine and robust brass pump head allows the motor to be run at a lower rpm whilst still achieving great results. All the pressure washer models have an automatic switch off function which automatically switches the motor off as soon as the trigger is released and the machine rests in standby. They also feature a soft start function making them more comfortable to use and control. Designed with two detergent tanks with metering switch for accurate dispensing of detergents. Features an easy to use professional spray lance which requires reduced trigger force so you can work in maximum comfort for longer periods. The unique design helps by absorbing recoil from the water jet more efficiently whilst the quick release coupling makes switching the spray lance and accessories a breeze. Built with threaded wheels which makes the pressure washer easy to transport whilst the compact design aid more compact storage. So why not come down to our Showroom in Buxton, Derbyshire to see our range of Pressure washers and accessories on display to take away the same day. We especially enjoyed putting the STIHL ones to good use by showing how powerful they were when put to the test, so come and see our promotional display and have a chat with our team in the showroom who can give you all the details and top tips.